This two-CD, four album, selection from Avid really does live up to the description 'classic'. 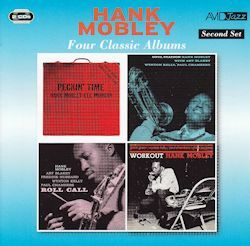 A couple of tenorist Hank Mobley's finest recording sessions, in Soul Station and Roll Call, are to be found here, together with two other occasions where there is also much to admire. It's not simply about Mobley's consummate stylings, whether of standards, or, more often, of his own bop-inspired originals. There's a mouth-watering collection of jazz musicians as sidemen at the top of their game here, practically all of whom were leaders in their own right at one time or another. The fact that they tended to play and record together on a regular basis meant that a high degree of empathy is apparent. Sadly, another common thread among several of the performers who play with such distinction on these albums were those, such as Paul Chambers, Grant Green and Philly Joe Jones, who all had drug-related problems that contributed to their comparatively early demise. Mobley himself was to be off the scene for ten years, through ill-health precipitated by his life-style, before dying of double pneumonia in 1986 whilst still in his mid-fifties, at a time he was contemplating a come-back. The highlights of the first album, Peckin' Time, are Kurt Weill's Speak Low and Mobley's own composition, Git-Go Blues. There's a Latin feel to Speak Low, accentuated by Mobley's rich sound, the inventive Wynton Kelly on piano and a lucid Lee Morgan on trumpet. Git-Go Blues, meanwhile, shows Mobley and the youthful Morgan to be a formidable front line backed by a rock-solid rhythm section where Charlie Persip, something of a 'go-to' drummer for many a Blue Note artiste in those days, makes his presence felt. Paul Chambers solos with style and substance with Kelly as incisive as usual on piano. Morgan is dynamic while Mobley elaborates on the theme with his customary assurance. On the second album, Soul Station, which features Mobley's quartet, This I Dig Of You is an absolute stand-out. The theme is one of Mobley's most memorable and he carries it off, as we might expect, with panache. There's a rattling good solo from Kelly and Art Blakey is tremendous on drums. Alongside that for quality is a peach of a standard, If I Should Lose You, which is given a consistently engaging interpretation by Mobley. Wynton Kelly, as so often, shows his mettle. I enjoyed, too, the group's jaunty and relaxed treatment of Irving Berlin's Remember. Trumpeter Freddie Hubbard, another musician on a hot streak, joined the Soul Station line-up for Roll Call, towards the end of the same year (1960). Once more, two Mobley originals are to the fore. My Groove Your Move is a typically catchy piece. Mobley is penetrating, Freddie Hubbard virile and expansive, Kelly nimble and Chambers resonant. A Baptist Beat is both blues and gospel inspired, with more than a hint of call and response. Hank is very much at ease and Hubbard confident and assertive. The standard, The More I See You, features some warm tenor, muted trumpet and Art Blakey is busily effective in the background. Kelly's take on the melody is quietly impressive. The final album, Workout, doesn't lag behind when it comes to appeal. Grant Green on guitar replaces Hubbard and Philly Joe Jones takes over from Blakey on drums. Green's influences included Charlie Christian, that virtuoso of modern jazz guitar who died tragically young at 25, and another giant of jazz, Charlie Parker. Grant's best showing here is on the blues-inspired final track, Greasin' Easy, which actually serves well as a showcase for the entire group. We have to wait four minutes in for a laid-back Green solo on another Mobley original, Uh Huh, but the wait proves worthwhile. The whole number swings along in a carefree manner with Mobley producing an uninterrupted flow of creative and punchy improvisation. Chambers contributes an excellent solo while Wynton Kelly simply floats along. The Best Things In Life Are Free, meanwhile, is an enjoyable take on the familiar song where Mobley illustrates comprehensively that Sonny Rollins was not alone when it came to joyous interpretations of popular songs. Fans of Philly Joe Jones will savour his brush-work here. There's an extended solo from the drummer on the title track, Workout, which confirms why he was so highly rated. These, then, are recordings which stand the test of time. They also celebrate Hank Mobley's gifts as a musician, perhaps not as fully appreciated as they might have been, compared with the acclaim John Coltrane or Sonny Rollins attracted. Anyway, here he is in his considerable prime and in the company of musicians whose understanding, at times, seems almost telepathic. What's not to like?